My Purebred Alaskan Malamute dogs Dec 2010: Left to right, Bert, Ooky, Ernie and Tinker. Alaskan Malamute puppies for sale here are seldom but an Alaskan Malamute litter is planned in 2014 or 2015 - I am a CKC Alaskan Malamute breeder in Ontario, Canada. My own 'pet' purebred registered Alaskan Malamutes are Canadian Kennel Club registered (or American Kennel Club registered in Bert's case) and are between 12.5+ years and 2 years of age. Collectively, they have many titles or certificates, which include conformation titles, working achievements, various temperament tests - and more than 50 various wins in 'working' competitions for Alaskan Malamutes, and other breeds - weight pull, snow pull and dryland events and races. I've had Mals since 1999. While I rarely sell any dogs, this site should help you to figure out who is a good Ontario Alaskan Malamute breeder - or anywhere else - for that matter! My dogs registered names are (including 'fancy' add-on titles): BISS, BIS, CKC CH (altered) Yukonjak's Ernie, WPD, CGN, TT, HIC (Ernie), and his niece BVIS, CKC, FCC, FCC Elite, UCI INT, NAT CH Yukonjak's Seal of Distinction CGC, TT, HIC (Ooky), her daughter CKC, FCC, FCC Elite, UKC RBIS ﻿CH Slushpuppy's Special Sleigher, ﻿WPD, HIC (Tinker) - and Tinker's two babies - BIS, RBIS UKC CH Slushpuppy's Voodoo Envy (Meme), and ﻿UKC / FCC CH ﻿Slushpuppy's ﻿Blackie Lawless﻿ (Dozer) - and the recent edition of Harry - Multi Best Puppy in Specialty Sledgerunner Keikewabic Slushpup - from ﻿﻿﻿Sledgerunner. I also have Saphira - Slushpuppy's Dragon Sleigher, too. I began with Tala and Ernie from Yukonjak. All of the dogs have group placings, in all the different show registries. Ooky was the first 'show dog' - although Ernie was 'converted' into one late in life. Ernie began his 'altered' showing career after he turned nine years of age - and finished his CKC altered conformation championship April 2013 - at eleven and a half years of age - and in four or five shows! Ernie is "Great, Great Uncle Ernie" to Meme and Dozer - giving me four generations of fantastic, working, show - and most important - 'pet' quality Malamutes - in the same house! Zoë Quinn-Phillips has been the co-owner of Meme (now Emi) since early 2014. Meme was given to Zoë, as a start to her breeding program, which you can find at ﻿﻿http://www.tonomimalamutes.com﻿﻿. Already proven show quality, with multiple breed wins and earning half her CKC CH, as a junior puppy and in a weekend, she also earned a Best in Show and Reserve Best in Show (also as a junior puppy) from UKC. She then won Best Opposite in Sweeps at a US Specialty, and her last show, here, won Best Opposite in Sweeps at our Canadian National Specialty. She's been in harness since two months of age, has done several public demos, and run quite a few miles, on sled and scooter (dryland). Meme has a lot to offer, as a foundation dog. More importantly, Meme / Emi was a proven lead dog on a sledding team, having been trained by her multi-gold winning Grammy Ook! Zoë owns ﻿http://www.pupwellness.com/﻿ and has a serious (ie not backyard or 'parking lot') dog training facility. She also has a degree in psychology ... Zoë 'temperament tested' the litter from which Meme was born, and was dead on, as to their temperaments. Meme and her brother were kept LARGELY because of Zoë's accurate assessment. Zoë is the first person in Quebec to receive the Certified Dog Behavior Consultant designation from the International Association of Animal Behavior Consultants and while located in Quebec is a fairly easy drive from the Eastern Ontario area. My Website is the story of the dogs lives - Ernie, his niece Ooky, her baby daughter Tinker, and Tinker's babies, Meme and Dozer (and the memories of Tala and Bert) - their activities and achievements, their Alaskan Malamute health certifications and what they mean (mostly OFA) including: hips, elbows, eyes, patella, dentition, cardiac, degenerative myelopathy, polyneuropathy, and thyroid. Ernie, Ooky and Tinker have mostly had the same health tests, whether pet or 'breeding' Alaskan Malamute. Each have AMCA chondrodysplasia (CHD) certificates. I have a giant Alaskan Malamute picture collection, too, thousands of photographs I've shot, (not all online). My main interests are in 'working Alaskan Malamutes' (fun competitions), pet life, and Alaskan Malamute nutrition. I have several canine and animal nutrition courses and / certificates (taught largely by DVMs or board-certified Veterinarian animal nutritionists) and Animal First Aid Certification. I have also have attended courses, seminars about nutrition, health, diseases, behavior - for general interest - but have worked for nearly two decades as a professor in 'computer' subjects. I have no interest to 'teach' any animal-related subjects - though I do organize or compete in working events. Mostly this Web site is a good resource to help you find an Alaskan Malamute puppy somewhere else. I've raised each puppy with the help of Ernie :) My dogs have many wins in working competitions like weight pull and dryland scootering - though they are only fun activities for us. We also sled, scooter and camp on some pack excursions, for fun, mostly. Ernie went to his first CKC championship show (a month after earning a gold medal in a weight pull, 2011, and at 9 years of age) in the newly-created CKC altered class - and came home with two Group Firsts, and points! I would expect the same care and lifestyle for any registered ﻿﻿Alaskan Malamute puppies﻿﻿ I produce; quality Alaskan Malamute pets, going to quality pet homes. If you aren't going to do activities with your Mal, then you probably should consider another dog breed. I have many pictures on this Web site, too. Finally, this link about good, ethical, breeders of dogs, and is the best definition I've ever seen, all in one organized chart. It's a good place to begin, in your search for a puppy, regardless of breed of dog. Ethical Alaskan Malamute breeders - or any other breed - do not allow cost to figure into a quality puppy; true quality puppies are priceless, as they have received the best of everything the breeder could give for the betterment of the puppy - and the breed. I am a member, in good standing, of several Alaskan Malamute clubs and organizations; the Alaskan Malamute Club of Canada, (AMCC); the Alaskan Malamutes Club of America, (AMCA) - which are 'breed enthusiast' clubs - and TIKO, Mush Larose Working Club, Alaskan Malamute Rescue (AMAL) (US) and the Alaskan Malamute HELP League in Canada. I also belong to the American Academy of Veterinary Nutrition for the benefit of my dogs diets (NOT to work commercially with people). And, of course, I'm a member in good standing in the Canadian Kennel Club. If you are interested in acquiring an education into 'dog nutrition' - and quite a few other topics - I have taken several courses from E-Training for Dogs, including ones from their Fitness and Nutrition Diploma - a well-organized institute with courses relative to canines (and some equine) subjects. Dr Ava Frick, DVM teaches the canine nutritional courses. It has helped me use the best food for an Alaskan Malamute. Her links are holistic veterinarian rehabilitation practice and animal nutrition and physical services. "There are no 'perfect' Mals in this world; only ones moving toward that goal." So, those pups are then sold unregistered, no shots, no titled / papered / tested parents - and with no homes waiting - who wants a dog with so little credibility behind it - are then listed for sale the fastest ways possible - Facebook, Kijiji, Craig's List. They really aren't much of a bargain, with the cost of treating the diseases, temperament problems. But the cost of that Alaskan Malamute puppy - is virtually 100% profit, whether it was $500 or $1500 dollars, when NOTHING has gone into its making other than thinking of it as a profit center. The best breeders give no thought to cost - they bred to keep a puppy. Be really wary and careful of those breeders selling the entire litter, and keeping nothing. A dead give away is 'first or second or third choice' - based on order of deposits - these would normally be the 'keepers' for the breeder. A 'Kijiji Malamute' could cost you thousands of dollars in vet bills, so you deserve to know why the litter was so poor they kept nothing. Worse, there are dozens of registered Alaskan Malamute puppies for sale, dozens of purebred (and mutt) breeders or kennels of registered dogs - quite a few rescue Alaskan Malamutes - and few homes - for those hundreds of dogs you are finding on, online forums like Kijiji, Craig's List and various other places. If you are comparing the Alaskan Malamute vs Siberian Husky, they are similar, but both are difficult to own, each like to escape, eat foreign objects, challenge their owners, etc. While a Siberian Husky might be considered easier than a purebred Malamutes, by no means are Sibes an easy breed. Every once in a while we find someone breeding the two breeds together - and that makes the resulting puppy a 'mutt' or mixed breed. In Canada, you should receive CKC (Canadian Kennel Club) papers with your purebred Alaskan Malamute (or any breed) and NEVER AKC papers, unless you purchased the Alaskan Malamute puppy from the USA. It is illegal to sell 'purebred with no papers' in Canada. Do you really want the dog you paid $500 - $1500 for, to be considered 'illegal' - and a mutt - by everyone else? In Canada, the dog should come CKC registered (Canadian Kennel Club - NOT Continental Kennel Club). The only reasons to breed in Canada, and sell via AKC registration, is an effort circumvent the Canadian laws, CKC tracking (for large numbers of dogs produced) or dodging taxes. Please remember cost does not dictate quality. And the life expectancy of Alaskan Malamutes (a healthy one) is 12 - 14 years. At the end of my Web site, are links providing more Alaskan Malamute information. In consideration of how many breeders Web sites, repeat the Alaskan Malamute breed standard, articles, and other copied information, I won't - but you can find links to them. Almost all of my Web site is custom material, since I wrote it or shot the pictures (or had someone shoot me in the pictures, if I am in them). For general Alaskan Malamute info Wikipedia does a good job providing basic information - and don't forget about Appearance, Temperament, Health, History and Training. Both the CKC Alaskan Malamute Standard and AKC Alaskan Malamute Standard - and AMCA has an Alaskan Malamutes Illustrated Standard available for sale. "The only thing an Mal CANNOT do, is what the owner will not take him to try!" To the right is an area for your Email address if you wish to be notified of 'updates' about my dogs events, news, health studies, registered Alaskan Malamute litters, etc. I can't imagine posting more than once or twice a month. 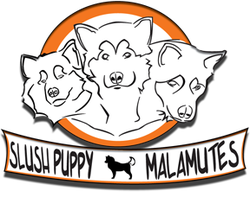 Registered Alaskan Malamutes - Slushpuppy Logo!